To most parents, a baby monitor is a must have a gadget in their nursing kit. With the help of a baby monitor, a mom can easily keep an eye on what her baby is up to when she is not around or while she is busy with her stuff. After all, mothers need a little break from nursing too. 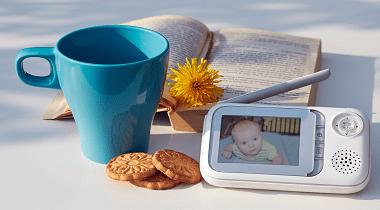 Nursing a baby can be challenging if you are a busy parent, but purchasing the very best long range baby monitors for you is not a more straightforward task either. For that you can check our buying guide. Various baby monitors have different prices depending on their features and specifications. But before you go for that expensive model, consider your needs first. Almost all models have essential functions such as clear sound and video quality, moderate maximum range, and sensor pads. However, some have extra features that you may not even need. Are you the type of buyer who would prefer expensive good quality products to cheap, poor quality ones? 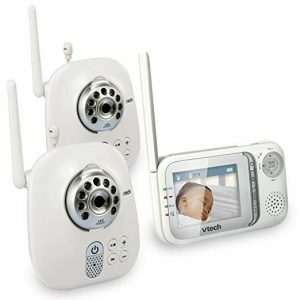 If yes, then the VTech VM321-2 Safe & Sound Video Baby Monitor is made for you. The good news is that you don’t have to break the bank to purchase this baby monitor; it is super-affordable. The monitor comes with two cameras and a monitor unit so that you can easily track your baby around the house. Also, the cameras are fitted with adjustable lenses making it possible for you to choose the best view angle comfortably. With a range of up to 1000 feet and a robust signal powered by the 2.4GHz system, you can smoothly go about your activities in the house or compound without having to worry of getting out of the monitor’s range. Full video color: With a high resolution 2.8 Inches LCD color display unit, you less likely to miss when your baby wakes up or moves. Split Screen Viewing: Since the baby monitor can be connected to not more than four cameras, it offers split-screen view mode. The view modes include; single view, dual view, and quad view modes. Automatic IR Night Vision mode: Each camera is fitted with 8 Infrareds LEDs giving you a perfect view of your baby comfortably at night without having to disturb their sleep. Talk-back Intercom: Sooth your infant with your voice by talking to him/her via the highly sensitive two-way intercom. 5 Soothing lullabies: If speaking to your infant through the intercom fails, try the preset five polyphonic lullabies that come with the baby monitor. Core Technology: Receive a stable, secure, and reliable signal powered by the 2.4 GHz system up to a maximum range of 1000 feet. Vtech also installed Dect 6.0 digital technology which facilities crystal clear transmission by getting rid of background noises. On top of that, Dect technology makes sure the signal is encrypted. 6-level sound indicator: The parent modules come with a 6-level sound indicator that allows you to monitor noise levels even when the unit is muted visually. Dimensions: 5 x 0.8 x 3.3 inches; weighs about 2.8 pounds. Power Source: It comes with one rechargeable, lithium-ion batteries. The battery life is 3.5 hours. Wall Mount: Comes with a wall mount that comes in handy when setting up the camera on a wall. Worried that the baby might get entangled in cords? The cord management system on the camera is designed as storage for the excess power cable. Just fold the wire carefully and store it in the port. Before anything after purchase, please make sure to read the VTech VM321-2 video baby monitor manual comprehensively before setting up. It is also advisable to test the units, then if any unit is not working, call the supplier and ask for a replacement. Parent module can be set to send alerts such as vibrations and a red light if; temperature drops below or rises above your preferred levels, the signal between the parent unit and the baby unit is lost, or when the rechargeable battery is low. Although the language is preset to English, you can quickly set to French or Spanish depending on your choice. It comes with two cameras and can be connected to up to four cameras. Comes with an extended signal range of up to 1000 feet. The camera has a cord storage system that stores the excess power cord. Automatic IR night vision mode intended for use during nights and dim. The extended rechargeable battery that has a life of up to 3.5 hours. The lights on the camera are too bright thus a bit annoying, but most baby monitors come with them. You may have to get used to them. Some customers have complained about the audio, and video quality is below average but honestly at less than $200, the VTech VM321-2 Safe & Sound Video Baby Monitor is a fair bargain. Additionally, it comes with two cameras, and other impressive features as summarized above making it one of the best dual camera baby monitors of 2018. 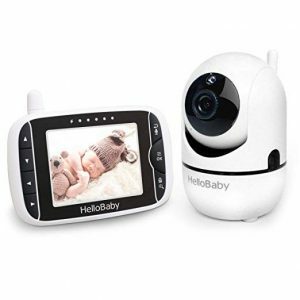 This budget baby monitor comes with a 3.2 Inch TFT LCD that can be connected to the video camera using enhanced 2.4GHz wireless technology which is made possible by frequency hopping and digital encryption technology that ensure security and reliability. With an automatic infrared night vision and temperature monitoring, you can easily monitor your baby during day and night. The remote-in feature is excellent as it lets you know if your baby is comfortable and safe. Another super cool eco-friendly feature is the “auto mute.” Auto mute is designed to automatically switch off the baby monitor when the sound falls below 50 decibels for a period exceeding seven seconds and to turn on when any noise is detected. Maximum Range: A good connection of up to 960 feet. 2-way Audio: 2 way audio with a highly sensitive microphone that allows you to communicate with your baby quickly. The monitor comes with auto-mute that mutes the sound on the parent’s module to stop the annoying background noise. Don’t mistake it for a defect when auto mute works. It also comes with a sound-activated LED indicator that is awesome. Alerts: 8 lullabies that will soothe your baby to sleep. Also included are eight different alarm systems that will help you schedule your time as you babysit. Dimensions: 4.7 x 3 x 0.8 inches; weighs about 1 pound. Infrared night vision: Automatic Infrared night vision that gives clear images during the night or in dark areas. 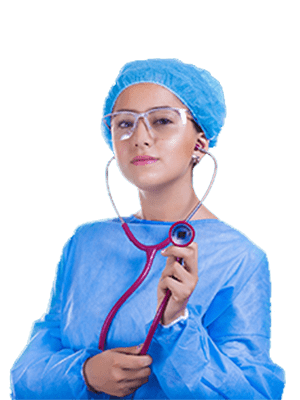 Temperature monitoring: Infrared temperature sensors enables you to easily monitor your baby’s body temperature without having to distress the baby. Power Source: Battery, manual, Li-ion battery smart charging. Accessories: one parent unit, one baby unit, two adapters, and one user manual. Warranty: The monitor comes with a 3-month money back warranty, 1-year quality guarantee, and 24-hour professional Service Center. Additional options: Automatic VOX power saving mode that allows you to save power by reducing the brightness. Just in case the battery power is running low, the monitor sends a low power warning to your module. If you go out of the 960 feet maximum range, the projector will promptly send you a No signal warning. Enjoy a more extensive range of up to 960 feet that allows flexibility and movement as you babysit. You can connect up to four cameras; allowing you to monitor the entire house. The monitor comes with controlled 2X zoom and digital pan technology. A pocket-friendly price of less than $100 on Amazon. Some customers still think that the screen is too bright even in the dimmest setting. The charging port is old fashioned. Despite the above-listed limitations, we still think the Hellobaby 3.2inch Display monitor is worth a purchase. What you get in return is an excellent baby monitor that has some super cool features such Infrared temperature monitoring, night vision, and an extended range of up to 960 feet. On top of such impressive features, you will not have to spend our entire paycheck a baby monitor. The HelloBaby baby monitor is very affordable which comes in handy for first-time parents who might be on a tight budget. 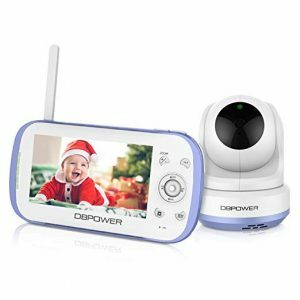 The DBPower multi-camera baby monitor is a game changer in the baby monitor market today. With its state-of-the-art features, it is guaranteed to ease the work of parents in taking care of their newborn babies. But perhaps what makes this high-quality baby monitor so popular is its automatic night vision feature. It won’t matter whether it is day or night; you can monitor your baby all round-the-clock. The DBpower continues to impress with its sound activated LED lights and split functionality. Its four cameras further help you watch your babies from any room they might be in. With the DBpower monitor, you won’t have to worry about the safety of your little one anymore. Split Screen: Yes. It supports split screen with up to 4 cameras. Monitor your baby more easily. Two Way Talk: Has an all new and improved speaker with a microphone. Enables you to make conversations with the infant. Send clear, audible commands to your baby stress-free. Setup: The baby monitor comes with a compatible mounting shelf that helps you set it up at any place of convenience – either at the ceiling or on the wall. It enables you to get the best view of your toddler with its stand-mount camera. It also has a user-friendly interface that is connected to the parent unit. The unit is battery powered and boasts of up to 9 hours of battery life. Digital Video Recording: The baby monitor is fitted with a DVR functionality that sets of sound whenever any noise is made. It is also compatible with an SD card that supports up to 32GB storage. You’ll never miss a beat with this nursery monitor. Improved Alert System: The DBPower baby monitor always alerts you when the baby is crying or when it has a low battery. It also warns you when you’re out of range so that you can always be vigilant. The alert volume can be set from 0-6, depending on the situation. You can reduce the volume when you’re sleeping and can increase the volume when you’re on the phone or watching TV. Multi-Camera Functionality: When monitoring your baby, you can use the auto-scan feature to get the best image and video quality. You can also switch cameras efficiently using the split-screen mode to get the most excellent view of your baby. Additional Features: The device has a temperature sensor that alerts you when the temp changes. It also has some lullaby features that ensure your baby gets the best night sleep. The nursery will always be fun and enjoyable with this monitor. The video baby monitor is very easy to operate. The infrared night vision feature lets you watch your baby at any time whether day or night. The LED lights give you a hassle-free baby monitoring experience. It’s always going to be an easy time monitoring your baby with this machine. Its features enable it to be outstanding among the lackluster monitors out there today. With all its features, the device can boast of being the best night vision baby monitor out there. It’s a must-have in your nursery. 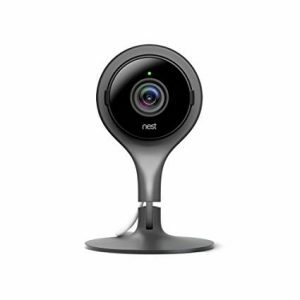 The Nest Security Camera is a 1080p monitor that is incredibly easy to use and set up. It is packed with incredible features such as a decent motion detection system and an impressive image quality and a high video quality that gives you the experience of a full HD movie. But with all its innovative features, it also has some few limitations. It requires the user to be a subscriber of the costly Nest Aware subscription to experience its full benefits. First, you’ll have to download the Nest app on your android phone. After that, you’ll use your smartphone to scan the QR code on the camera’s rear end. Super easy. But mark you, it takes quite a few minutes to link the camera to the network; you’ll have to be a bit patient. The camera can be placed in a safe and hidden spot thanks to its wall mount. It can also be adjusted to give you notifications whenever any sound or movement is detected. With its special speakers and microphone, you can talk to your baby easily from a long range. Video Performance: The Nest Cam baby monitor gives crisp, clear image thanks to its1080p resolution. You can watch your baby in high quality, Full HD, never missing on any movement or activities. Its 8x zoom feature, and an image sensor further gives you the feeling that you’re right there with your little one. Its impressive glass lens also doesn’t disappoint. Audio Performance: The device has been fitted with the two-way talk functionality and decent inbuilt speakers that enable you to give commands through the camera. You can take pleasure in singing for your little angel a lullaby through the system’s microphone. The downside to this feature is that the speaker isn’t so compelling — it’s pretty basic even for a baby monitor. Nest Aware Subscription System: To enjoy the full benefits of the Nest Cam, you’ll have to be a Nest Aware subscriber. While it might be costly, it has added features that make it all worthwhile. With the Nest Aware, you’re guaranteed of a better and more improved motion detection system. You can also save clips while also setting up ‘action zones’. These zones are the places you chose to be notified about. Without the subscription, you only receive a few notifications, and your live stream isn’t that great. It has a very desirable image quality both during the night and day. It is straightforward to use and set up. Its motion detection is very impressive compared to other baby monitors. Its subscription plan is very costly. It can only be used in areas with a good internet connection. The Nest Cam is a very good option for anyone who can afford the Nest aware subscription and has a decent internet connection. The cam and nest aware combine to form a perfect home monitoring system. The Nest Cam on its own and the subscription isn’t enough; it also requires the thermostat. While this may prove to be expensive, it is worth it. The device is undoubtedly the best long range baby monitor in the market today, that is, ignoring its subscription plans. The LeFun surveillance camera is favorite among most parents because of the ease of use and the excellent functionality it has to offer. You can easily connect the video monitor to your home Wi-Fi. Once it is connected, the Wi-Fi baby monitor then streams high-quality video and audio signals to a mobile surveillance app, MIPC, installed on your android phone, iOS, tablet, or PC. No cords or cables are required. This cloud IP baby monitor gives nursing mothers the freedom to go about their day to day activities while at the same time keeping a hawk eye on their little ones. Functionality: Once connected to Wi-Fi, the surveillance camera transmits to your Android, iOS, tablet or PC in a couple of minutes via the MIPC app. You will get HD 720p video and images that are quite clear. LeFun made it possible to fast forward or playback videos once they are recorded on the microSD. Dimensions and color: 5.1 x 4.9 x 5.3 inches, weighs 12.3 ounces; approximately 0.8pounds. Most of the cameras come in white color. Two-way audio: The cloud IP camera comes with an inbuilt microphone, speakers, and anti-noise filters that will allow you to communicate with your baby comfortably. Smart Motion Detection: Keep track of the baby’s movements via the motion detectors that automatically send alerts to your iPhone or iPad. Pan/ Tilt: Get the best view by adjusting the wireless camera’s angle. Pan (horizontal rotation) the camera up to 350° and up to 100° for the tilt (vertical rotation). IR LED Range: It covers a view distance of about 32ft. That is around 10 meters. Infrared night mode makes it possible to monitor your baby even in poorly lit rooms or during the night. Storage: The camera does not come with a microSD, but the Wi-Fi baby monitor can support one of up to 32 GB capacity. Certification and warranty: The financial level encryption technology makes sure that you have a safe, secure, and reliable connection across all your devices. LeFun surveillance cameras are CE, FCC and RoHS certified. Get a full one-year Guarantee and professional customer care. Upon purchase, you will find; one camera, a user manual, one USB adapter, USB mounting accessories, and one Ethernet (RJ45) in the package box. Download the MIPC app from either google play or the Apple app store. Sign up an account once you launch the app. Power on the surveillance camera. When the camera is on, log in your to your MIPC account. Click “+” from the MIPC app to add the Wi-Fi camera. You will have to scan the QR code and track the voice from the camera. The LeFun IP surveillance camera is now ready for use. The surveillance camera comes zoom, tilt, and pan functions. It connects wirelessly to your devices making it simple for you to monitor the infant even from your workplace. The sound quality is not good enough. Soft voices or noise are quite difficult to hear. Less secure as it is easy to hack the sound and audio transmission signals. However, you can change the password and internet settings to make sure that the signals are safe from hackers. 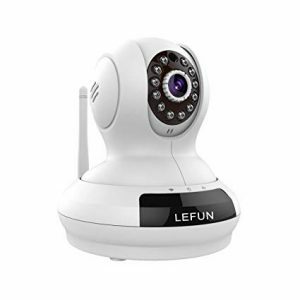 Is it advisable to buy the LeFun Wireless Surveillance Camera Video Baby Monitor? Yes, it is worth your consideration especially if you are on a tight budget but very busy to stick around your home. At a pocket-friendly price, you can purchase this camera on Amazon. However, make sure you enhance the internet security to deter someone from hacking your signals. Nature is so dramatic. You can’t even realize what is happening around you and your baby. It is hard to believe until you saw it. Just check out the video and then you will understand the matter what we are trying to say and crying need for a best long range baby monitor. After watching the video you will gonna buy these baby monitor. Promise! Don’t rush into purchasing the monitor with the highest price thinking that it will cover all your needs. Long range baby monitor for you is the one that meets your needs. We all have different needs, don’t we? Some parents have hectic schedules and are always away from home. Others are always at home. If it is the monitor’s range that matters to you, then go for the right one what we have short listed. Consider a project with multi-room monitoring; do you have more than one infant that you are nursing; buy a child monitor that can be connected to more than one camera. Multiple screens focusing on different rooms will help you monitor your kids in a very convenient way. Purchase a model with 2-way audio technology; models with 2-way audio lets you sooth or talk to your baby as well as listen to any sound or noise coming from your infant’s room. Such monitors have inbuilt microphones and speakers. Make sure the audio quality is good enough before you buy any baby monitor. Alerts and alarms; Go for a model that sends you notifications or vibrates when the battery is low or when you are about to go “out of range.” Some baby monitors can post screenshots of your baby to your iPhone or any other connected device after a preset number of hours or minutes. Other models come with sweet lullabies that will soothe your baby to sleep if you are busy or not around your house. Find a monitor with excellent night vision; Night vision is one of the must-have features. You need night vision to see the activities of your baby during the night or when the baby is in a poorly lit room. Buy a model with zoom; tilt (horizontal rotation), and pan (vertical rotation) features; to adequately monitor your young one, it is crucial to set the camera at an angle with the best view. A camera with zoom in and out, tilt, and capabilities come in handy when finding that perfect view. Pick a baby monitor that you can afford; how deep are your pockets? Your budget comes in first before anything. Keep in mind what your needs are. Some expensive high-end monitors may have some extra features that you don’t even need. The best monitor for you is one that meets your requirements while at the same not spending your entire paycheck. Go for a model with a long monitor range; nowadays, most baby monitors are wireless, and their range tends to vary. It all depends on the signal frequency in use. Higher frequencies have long ranges. Furthermore, higher frequencies help limit possible interference and boost clarity. Buy a monitor with a frequency of 900 MHz or more. However, if you live in a small apartment, there is no need for the extended ranges; cheaper short-range baby monitors will be just fine for you. Other important aspects to consider are the availability of temperature sensors, how strong or dim the night lights are, talk back intercom, connectivity to other devices such as smartphones, security of signals being transmitted, and battery life. Q:How can you extend the range of baby monitors? There are a couple of options if you intend to continue the range of baby monitors. One of the cheapest ways is by replacing the existing antenna with a high gain one. Alternatively, though an expensive option, you may purchase a booster/repeater. If these options fail to improve your child monitor’s range, then it is time you get a wireless IP camera at a fair price. Q:“Baby monitor out of range.” How do you fix this? Bring the camera and the monitor close together; switch on both of them. From the menu of the monitor, select “add camera.” Press and hold for a few seconds the center button on the monitor and the pairing button at the back of the camera. Close the menu on the monitor. By now, you should have a clear image of the baby if both the baby and the monitor units have no other technical malfunction. Q:Do they monitor your heart when you are having a baby? ANSWER: The market is flooded with a wide range of options to help you monitor your child. However, a baby monitor can only work after the baby is born. Before birth, consider alternatives like prenatal sensors, infant socks, fetal Doppler, etc. Q:What is the range of house arrest monitor? ANSWER: Between 50 and 300 feet. The radio frequency transmitter sends signals with location details to the receiver. If the person under house arrest goes “out of range” or tampers with it, the monitor automatically sends alerts to the monitoring agency. GPS ankle bracelets are even better since it is the officer in charge who determines the range. Q:When was the baby monitor invented? 1937. The kidnapping of the Lindbergh baby in 1932 inspired the president of a company called Zenith, Eugene McDonald, to develop a makeshift baby monitor so that he could easily monitor the level of noise in his daughter’s room. Later, he gave engineers the task of coming up with a modern, streamlined child monitor. It was a Japanese designer, Isamu Noguchi, who then came up with a simple and well-designed infant monitor. Q:What are the price ranges for a baby video monitor? The price ranges depending on the specifications and features. For as low as $45, you can buy the LeFun IP surveillance camera from Amazon. It all scales down to your budget and needs. Q:Where can you buy a baby video monitor? The most convenient place to buy a good baby monitor is an online store such as Amazon, Walmart or eBay. Some stores such as myLevana, Motorola, local supermarkets, and store are also reliable.